I have a lot of photos of squirrels running. Dashing to the right, speeding off to the left, even exiting stage rear. Usually trying to get the hell away from me because they have enough of a distrust of humans that even the friendly photographer might be a danger. But this, I am almost positive, is the ONLY photo I have of a squirrel running TOWARDS me. Have the squirrels finally had enough of me violating their privacy and now they are going to launch a direct assault on the paparazzi? When I featured this photo as a Saturday Squirrel four years ago, Marilyn took it as a prompt and wrote an entertaining piece dealing with such a brave, yet obviously demented sciurine. Beware trick or treaters… nuts aren’t the only treats this crazed squirrel may be after tonight! This entry was posted in My Top 200 Photos and tagged charging, forward, photo, photography, running, squirrel. Bookmark the permalink. 17 Responses to #62 – Charge! He looks like one of those players in an American football match where they huddle together and then get ready to attack each other. One of my friends sent me a video yesterday of a squirrel eating french fries out of her hand. That is a squirrel that only Alfred Hitchcock could truly love. Imagine his sequel to “The Birds” titled “The Squirrels.” I just bought two bird feeders that are supposed to prevent squirrel attacks — which always makes me laugh. You can’t stop a hungry squirrel. One of them said (in their literature): “You cannot stop a squirrel. You put out food and they will eat it, but at least our feeders will survive the attack and when they are done eating, you’ll still have a feeder.” Nothing with plastic. Squirrels LOVE plastic almost as much as the Duke loves empty medicine bottles. But to be fair, he also loves great chunks of fallen tree limbs which he renders into woodchips. I don’t know HOW his gums deal with it. Mine start to bleed even thinking about it. We don’t get trick-or-treaters here. Our road has no lights, no sidewalks, and it twists and turns. Moreover, the houses are a quarter of a mile apart. I don’t even buy candy, but I WANT candy corn. On the upside, it’ll be 1/2 price tomorrow. Someone in Boston was holding a sign that a Red Sox fan slaughtered the people in Pittsburgh. We are all mentally reaching for the stars these days. Stupidity like that simply cannot remain earthbound. Squirrelproof birdfeeders are a huge myth, but yeah, I guess it’s good that they are at least durable since a squirrel will happily destroy a feeder if necessary to get at every last morsel. Squirrels will chew on almost anything because they have those growing incisors like most other rodents and need to wear them down. They can crack open hard corn, so I’d hate to feel what a squirrel bite would be like…. I’ve never met anyone who was bitten by a squirrel. I have, however, a lot of cables that have been squirrel-abused. That guy is a big ‘un and could play Center for some squirrelball team – he looks like he just snapped the ball back to the quarterbacksquirrel !! GO TEAM GO. He’d be a varsity champ on the Ding Dong School football team. I wonder if he’s dating Suzie or….. ick, you know who? Oh no……say it isn’t so…….!! He does bear a slight resemblance to one Peyton Manning…. Well, I’ve got about 20 or so I like better… but this one is truly unique. 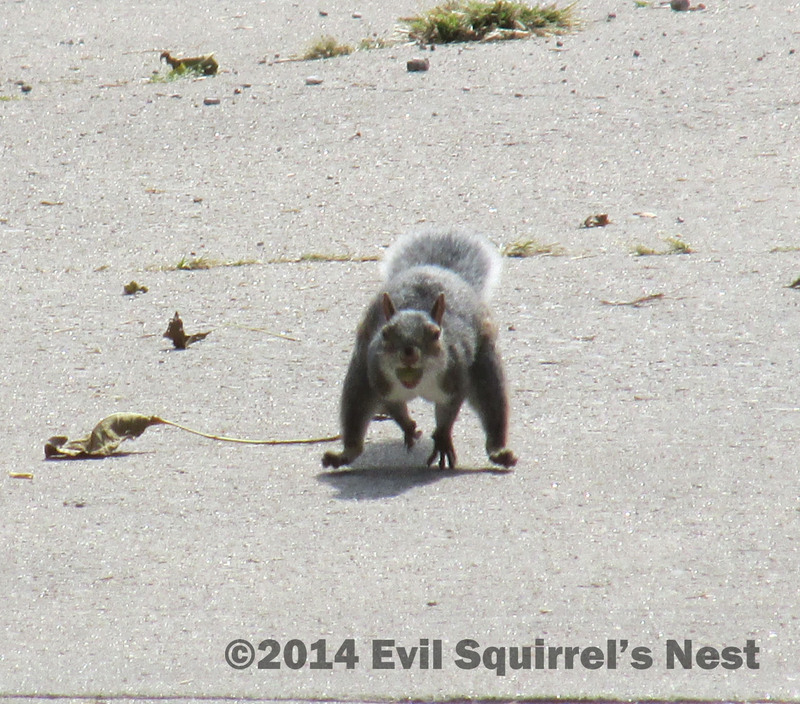 He’s coming for you and your nuts…. figuratively, of course.